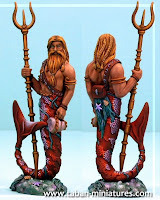 Zharc is renowned amongst the Nautican race for his hunting exploits in the deep, he operates alone in the oceans and is credited with awesome feats of hunting prowess. Zharc has lived for hundreds of years and has faced and survived many extremely dangerous, life threatening encounters in the deep. He fought and killed the mightiest Great White shark that ever swam the oceans with his bare hands. The encounter lasted three days and Zharc emerged half shark, half Nautican. The Weresharks are his offspring. The armband made from the teeth of the Great White Shark fortifies Zharc's nerves and makes him Stubborn. Unable to contain his voracious appetitie, Zharc becomes stronger and more ferocious as he gets a taste for his opponents blood. Like normal Frenzy, if Zharc is beaten in combat the Wereshark frenzy is lost for the remainder of the battle. * If Zharc joins a unit of Weresharks resolve his Wereshark Frenzy separately from the unit's. The unit does not get any additional attacks from unsaved wounds caused by Zharc and Zharc does not get any additional attacks from unsaved wounds caused by the Wereshark unit. Zharc can operate alone or lead a unit of Weresharks (his children) into combat. He will never join a unit of "non-Weresharks." A single unit of Weresharks lead into battle by Zharc counts as a special unit choice rather than a rare unit choice.